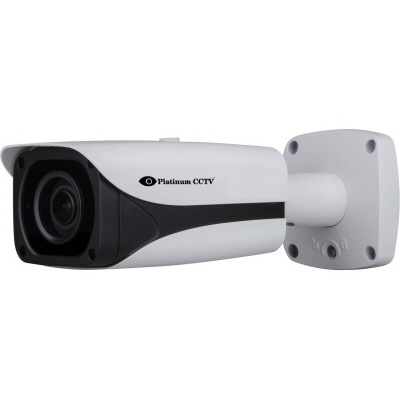 Platinum CCTV has just made securing your business easier with the launch of our 6th generation HD IP bullet camera. 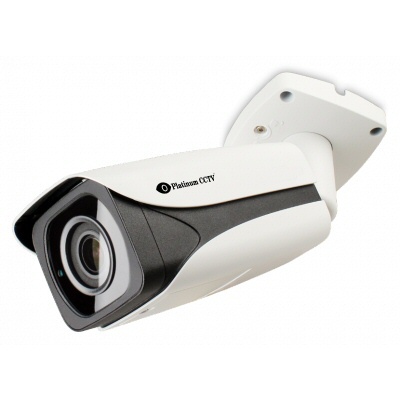 This camera has built on the successes of our previous model IP cameras, taking advantage of newer technology to provide higher resolution (2688x1520) video in smooth frame rates, motorized 2.7-12mm lens, true auto-focus, SMART array IR night vision, H.264 dual streaming video encoding, true WDR, 3D Noise Reduction, and intelligent video analytics all squeezed into an armored IP67 weatherproof bullet housing. This camera provides crisper, clearer color video and better infrared night vision than any camera we have ever manufactured. Now is the time to upgrade the visual security coverage around your business. Previous HD IP Cameras (and HD-SDI cameras alike) have been limited to 1080P resolution (1920x1080). While these cameras provide great quality video and are still impressive when it comes to protecting a business, we believe in pushing the envelope to deliver the best quality. That is why we have been pushing resolution to provide greater clarity and quality. The HD-9446 HD IP Bullet Camera is our latest release, which includes a 1/3" 4 MegaPixel Image sensor delivering 2688x1520 resolution video. 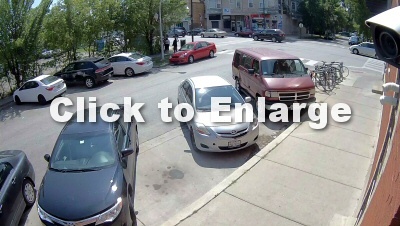 This breakthrough in video resolution means that you can identify a person, vehicle or even license plates on vehicles from greater distances than before. 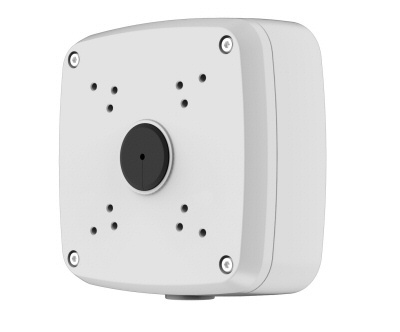 The image sensor we use in this camera is also the lowest light sensitive image sensor we have used in an HD IP camera (0.01 Lux) which means that it provides even better quality in extreme low and no-light conditions. While the HD-9446 camera is not our first offering with a motorized zoom lens, we built upon our previous models to ensure we were delivering more than before, even when it came to operation of the lens. This new lens allows the camera to deliver between 100° wide view and 30° zoom with a greater number of zoom steps, allowing you easier adjustment and more points of zoom. Our previous generation zoom cameras had a stepped focus, which means that the focus points were pre-programmed. The all new HD-9446 model camera has a true auto-focus capability, which means it actually calculates the best focus every time the camera is zoomed in or out, to ensure you always achieve the best possible image clarity and quality. Rounding off the lens enhancements, is the new DC auto-iris capability, allowing the camera to properly adjust to the amount of light present physically, eliminating the need for artificial boosting of gamma that can cause static noise on the image. When combined into the new camera, this lens helps further enhance the video capabilities and clarity at each point. At night is when most of the problems at your business occur, so the clarity during evening hours is paramount when it comes to selection of a security camera. If you think we went beyond the call of duty when improving the lens for our new bullet camera, then you'll see we went overboard when it comes to improving our night vision capabilities. We started with our best ever low-lux (low-light image sensor). The light sensitivity of an image sensor determines how much light it requires to render a picture properly, but it also has effect on the Infrared capabilities of the camera, as IR light will penetrate easier into an image sensor with a lower lux rating. The new 1/3" CMOS image sensor included in the HD-9446 camera has a 0.01 lux rating, which is one of the first that is akin to the older analog cameras in terms of lux rating. This is brilliant news, because the older analog technology always was better at lower light rendering due to the availability of lower lux image sensors. With MegaPixel cameras, there were always more pixels packed tighter together, so most require a greater amount of light. The new lower lux image sensor is enough to provide great low-light video in color even in low light conditions, but also enhances the infrared night vision capabilities of the camera. We paired new SMART Array style IR LEDs with this image sensor. These new LEDs now deliver more powerful IR light during extreme low light conditions, and will even dim down areas of high illumination so that the picture will not be washed out even if someone walks right up to the camera. This is a problem that many IR cameras experience, so was something that we wanted to solve in our newest HD-9446 model camera. The SMART IR technology senses the over exposure of IR and automatically dims to obtain better image quality and clarity. The result is a much better picture clarity at night. The bullet camera design is inherently superior to dome style cameras in providing infrared night vision capabilities. This is because a true glass front cover can be employed while keeping the cost palatable. With dome style cameras, a polycarbonate cover must be used, which can more easily be scratched diminishing the quality of the image that would be visible. However, the main reason that night vision can suffer with dome style cameras is actually inherent in the design itself. With Dome cameras, the camera's lens and IR illuminators are behind the same clear dome cover, seperated by a foam isolator that touches up against the polycarbonate cover. When the IR illuminators turn on, light disperses across the dome cover and if there is any dirt, fingerprints or scratches on the cover, they show up as bright spots on the dome and block the view of the camera. With our bullet camera design, there are actually separate glass pieces in front of the lens and in front of the IR illuminators, separated by an isolator ring. This prevents any of the IR light from reflecting back in front of the lens at all. This means you will get a crisp, clear image during night vision with no light bouncing back into the lens. 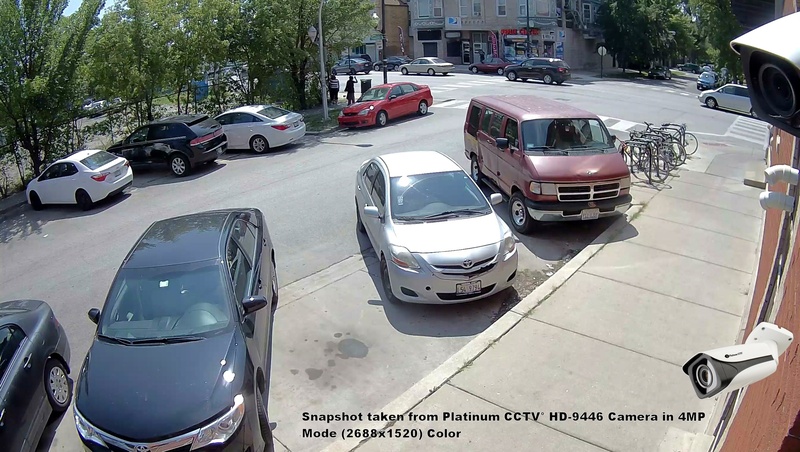 Most HD IP Cameras have a secondary stream, which allows for smoother, lower bandwidth secondary stream that is useful for NVRs that perform motion detection or cell phone streaming. Normally, that is sufficient, but for our flagship HD-9446 camera, we have taken it a step further to provide better video processing and more options. These cameras now have capabilities for three distinct video streams, allowing your NVR software to process the video in multiple ways. The improved video processor that permits three video streams also features our new ROI (Region of Interest) configuration, which allows for a greater bit rate and video quality in a specific area of the camera view, allowing you to save bandwidth on less important areas of view, while delivering optimum quality in the important areas. 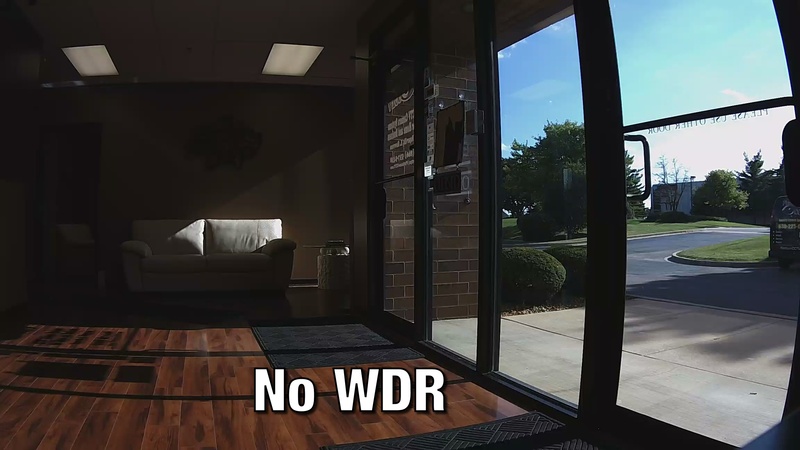 Many IP cameras have a DWDR (Digital Wide Dynamic Range), this type of WDR will boost the gamma in darker areas of the picture in order to help even out the image. However, with digital boosting as the gamma is increased, static is introduced into the video as well. While noise reduction can help to eliminate the static, it is best if the image quality is enhanced using other methods. 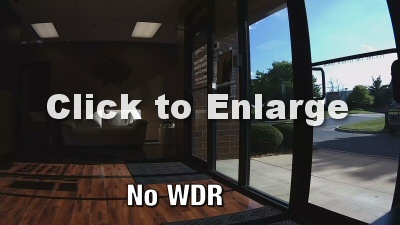 This is what is accomplished by the true WDR built into the HD-9446. The WDR of this new camera delivers the ability to capture long and short exposure times together into a single picture for best results and less distortion. This makes the cameras a clear choice for virtually any lighting condition. 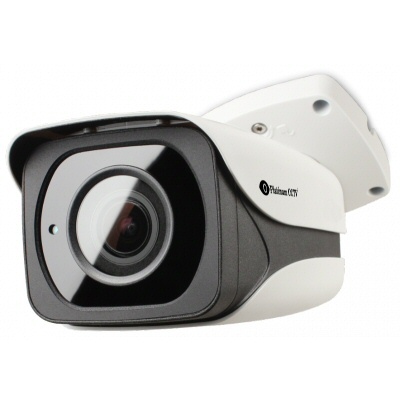 The HD-9446 camera also includes an upgraded weatherproof housing with heavy duty hinges and brackets and aluminum armor. This heavy duty housing helps protect the camera from vandalism or attempts to move the camera. Most outdoor cameras are weather-resistant with an IP66 weather rating. With an IP66 rating, they are designed to protect against powerful jets of water without entry of water. This should be good for most weather environments, overtime the water seals can rot out and permit water entry. While this is sufficient for most cameras, for this new camera we have stepped up our game once again, certifying the housing for IP67 which protects the camera even against immersion of water up to 1 meter depth. This rating also protects the camera from any dust particles in the air which is excellent for manufacturing conditions as well. One of the traditional drawbacks of bullet style cameras is the adjustment of the camera angle can be somewhat limiting and difficult, making the installation tedious at times. Obviously we don't wish our customers and installers to have a difficult time with the installation and setup of their cameras, so some redesign of the traditional bullet camera was in order. Our new model bullet camera has innovative locking mechanism to allow all joints of the bullet housing to lock with a single screw. Simply loosen the adjusting screw, move the bullet around to suit your installation needs and re-tighten the screw to lock down all adjustments. This makes this bullet easier to install than any other bullet camera on the market today. Another factor that makes many installers lean towards dome cameras instead of bullets for exterior security, is the troubling factor of the cables. While some cameras try to provide room in the base or bracket of the bullet to allow stowage of the cables, it rarely will contain all of the necessary cables, necessitating the boring of a large hole into the wall to try to stuff large connectors into the inside of the building. 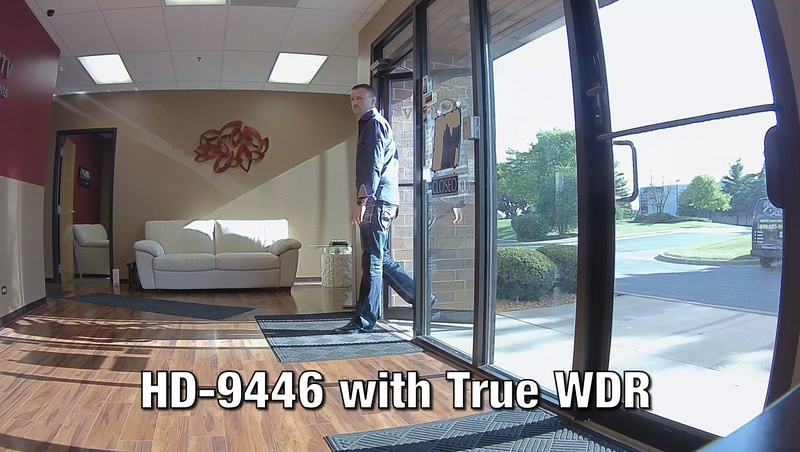 This is why when designing our new HD-9446 bullet camera, we designed an optional backbox that could be used to conceal all cables, allow connection to standard conduit, and reduce the labor that is required to run cables out of the building. This backbox can then be used to mount this bullet camera to a Corner or Pole mount bracket as well, delivering an even greater versatility to your security camera installations.